It has been an amazingly busy month for this Super Gay Urban Warrior Mom. Whew! Time to get back to the fishy dishing about movies. Yes, Ma’am! Ok. My lovable girlfriend and I were searching the awesome Gay and Lesbian on Demand collection (Thank You, Xfinity!) when we found this twinkfest. 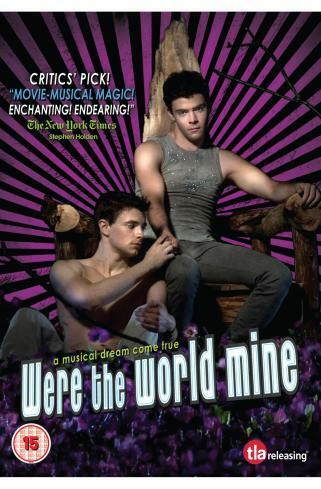 Were The World Mine is a delicious half naked romp through Shakespeare’s, “A Midsummer Night’s Dream”. Folks, it doesn’t get much gayer than this. Director Tom Gustafson is serious about his Shakespeare. Timothy played by Tanner Cohen is moody, oppressed and beautiful. He’s out and has been disowned by father. His mother is supportive but still kinda blames him for being the gay kid who caused his father to leave. It’s all so maudlin. Tanner is beautiful though and runs half naked in wings for most of the movie so it’s definitely worth the sad parts. The songs are fun and the boys are hot. Isn’t what really matters? The story is kinda standard “Young, Misunderstood Boy in a Small Town” with a cool twist. It’s kinda cerebral but cute enough for us non English majors. I loved it! I won’t even try to explain the Shakespeare stuff because to be honest, why?